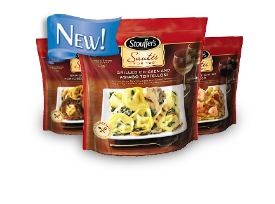 Head to stouffers.com for a coupon for $1.50 off their Stouffer's Sautes for Two! I like to take things like this and add more pasta, rice and/or veggies to the bagged meal to make it large enough for the whole family! Looking for more Coupons? Check out the Coupons tab or Print directly from Coupons.com, Red Plum or SmartSource!